Postdoctoral Scholar, Ph.D. 2004 George Washington Univ. Ingi is trained in the systematics and evolution of spiders, particularly spiders that express cooperative web spinning and prey capture behaviors. More generally, Ingi's research interests span shore ecology, morphology, taxonomy, biodiversity, sociality, inbreeding and phylogenetic theory. 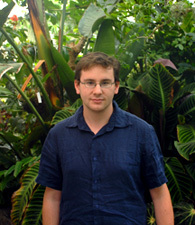 His work in the lab focuses on the evolution of silk biomechanics in orb-weaving spiders. You can find out more about Ingi's research at this link. Ingi began a faculty position at University of Puerto Rico Autumn 2008. Agnarsson, I., Kuntner, M., Coddington, J. & T. A. Blackledge. 2010. Shifting continents, not behaviors: independent colonization of solitary and subsocial Anelosimus spider lineages on Madagascar (Araneae, Theridiidae). Zoologica Scripta. 39:75-87..
Blackledge, T.A., Boutry, C., Wong, S.C., Baji, A., Dhinojwala, A., Sahni, V. & Agnarsson, I. 2009. How super is supercontraction? Persistent versus cyclic response to humidity in spider dragline silk. Journal of Experimental Biology. 212:1981-1989. (cover article featured in Inside JEB, New Scientist,WKYC-TV). Agnarsson, I. & Blackledge, T.A. 2009. Can a spider web be too sticky? Tensile mechanics constrains the evolution of capture spiral stickiness in orb-weaving spiders. Journal of Zoology. 278:134-140. (Featured in Cosmos Magazine). Agnarsson, I., Boutry, C.*, & Blackledge, T. A. 2008. Spider silk aging: Initial improvement in a high performance material followed by slow degradation. Journal of Experimental Zoology 309A:494-504. Cecilia is studying how individual level plasticity in the mechanical performance of spider silk is related to variation in web architectures and the environment. She is particularly interested in testing the hypothesis that spiders can actively control the structural and material properties of silk. Cecilia is also interested in relating variation in silk performance to functional differences between webs during prey capture. Her research has been highlighted by National Geographic. Cecilia has degrees in Biology from Université des Sciences et Technologies de Lille and from Université François-Rabelais Tours.You can read more about Cecilia's research here. Boutry, C. & T.A. Blackledge. 2010. Evolution of supercontraction in spider silk: structure-function relationship from tarantulas to orb-weavers. Journal of Experimental Biology. 213:3505-3514. Boutry, C.,* & Blackledge, T.A. 2009. Biomechanical variation of silk links spinning plasticity to spider web function. Zoology. 112:451-460. Sam came to the lab from Miami University where he worked on the ecology of wolf spiders in agro-ecosystems. He is broadly interested in evolutionary biology. For orb-weaving spiders, fitness may depend almost exclusively on capturing large, rarely-encountered, difficult-to-capture prey. Samdeveloped a stochastic model that synthesizes ecological, metabolic, and biomechanical data to simulate orb-weaving spider foraging, growth, and survival. Spiders in stochastic simulations gained the most mass by capturing a single large and difficult-to-capture prey comprising the majority of their diets, rather than from smaller and more numerous prey. His results reinforce the hypothesis that orb webs are under intense selection for impressive potential to dissipate large amounts of energy. A former Biomimicry Fellow at The University of Akron, with a Ph.D. in Integrated Biosciences (graduation in May 2017), Bill aspires to not only research how colors are produced in spiders, but also to translate the new knowledge that he learned into biomimetic solutions, and apply them to real world scenarios where humans use colors. Bill's research on blue tarantulas did just that! It started with basic research showing that the blue structural color of tarantulas evolved convergently from at least eight different origins independently. Bill then turned something that he learned from that project into a unique synthetic structurally colored material with the largest viewing angle demonstrated so far. Bill's research success didn't go unnoticed. In fact, his research was not only covered by National Geographic, BBC, The Atlantic, ... etc., but picked up by journals like Science and Nature Nanotechnology. Altogether his research has been reported in twelve different languages worldwide. Bill believes the blue tarantula case study is just the beginning. Spiders will be a major source of inspiration for his research, providing novel solutions to human challenges for many years to come. 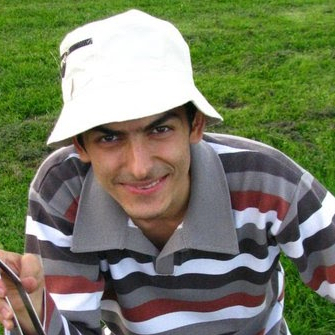 Mohammad joined the lab from Isfahan University, Iran. Mohammad investigated the role of protein expression in determining the material properties of orb spider silk. Dragline silk is a blend of two proteins with divergent amino acid sequences. Both contain poly-alanine repeats that fold silk proteins into beta-sheets that stack together into hard nanocrystals. But, MaSp1 (major ampullate spidroin) contains glycine-glycine repeats that fold silk proteins in relatively rigid helices while MaSp2 interrupts those repeats with prolines (glycine-proline-glycine-glycine) that kink the protein into an extensible "nanosprings". Thus, spiders might be able to control the material properties of their silks by varying the expression of MaSp1 versus MaSp2. Mohammad studied the relationship between variation in the chemical composition of dragline silk and its performance from both intra and interspecific perspectives to test this hypothesis. Milan spent a year in my laboratory investing the relationship between the morphology of silk glands and the material properties of silks. By comparing silk production apparatuses across evolutionarily diverse species of spiders, he hopes to gain insight into key innovations in silk spinning. Milan returned to the Crop Research Institute in summer 2010. Raphael came to UA from Ecole Nationale Supérieure d’Agronomie de Toulouse in France for a summer research internship to learn about spider behavioral ecology. Raphael studied the energetic costs of cobweb construction. Working with Peter Niewiarowski, Raphael used respirometry to measure the behavioral costs of web spinning (spinning silk and assembling it into a web) and calorimetry to measure the material cost of the silk itself. We are currently analyzing the data for publication. Raphael is starting a PhD on spider ecology at McGill University! 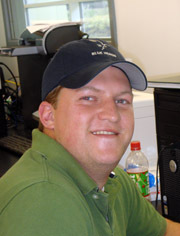 Andrew's expertise is in the functional morphology and biomechanics of arthropods. He characterized locomotion in harvestmen for his master's research. 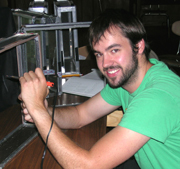 More recently, Andrew's Ph.D. focused on hydrodynamics during gill movements in mayflies. His work in the lab focused on functional mechanics of silk. Andrew is now faculty at Tabor College. Sensenig, A., Agnarsson, I., Gondek, T.M. & Blackledge, T.A. 2010. Webs in vitro and in vivo: Spiders alter their orb web spinning behavior in the laboratory. Journal of Arachnology. in press. Andrew got his BS in biology from U Akron and came to the lab after teaching in China for several years. Andrew is currently working on the relationship between the chemical compositions of spider silk glues and their adhesive properties. 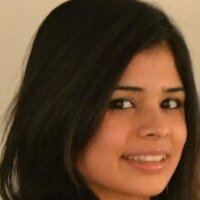 Shagun came to the lab after working in pharmaceutical research at Mankind Pharma. Shagun investigated the hypothesis that spider silks have antimicrobial properties. While such properties are widely cited, there are surprisingly few rigorous tests. Both serial dilution assays and SEM analyses were performed on Argiope aurantia dragline silk exposed to both gram-positive and gram-negative bacteria. No effects were found in bacterial growth curves but bacteria showed low adherence to the silk. Thus, Argiope dragline silk does not appear to actively inhibit bacterial growth but is resistant to adherence of some clinically relevant gram-negative bacteria. Spider dragline silk may have unique surface properties that prevent biofilm formation in gram-negative bacteria. Thesis: Can spiders (Argiope aurantia) indirectly affect the fitness of orange conflowers (Rudbeckia fulgida) by limiting pollinator visitation? Andrew investigated how the presence of spider webs influenced plant-pollinator interactions. 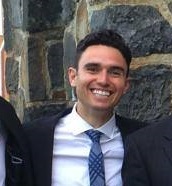 Andrew earned his B.S. in Wildlife Biology from the University of Alaska Fairbanks. Thesis: Does plasticity in the web building behavior of the western black widow spider, Latrodectus hesperus, affect foraging and defense? Jacki is studying how organisms can adjust their behaviors to respond adaptively to selective pressures from both predators and prey in their environment. 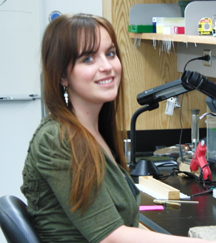 Her research focuses on the cobwebs spun by black widow spiders. These spiders dramatically alter the shapes of their webs depending upon how much food they capture and Jacki is currently testing the effects of these different web shapes on how black widows capture prey and defend themselves against their own predators. Jacki received her B.S. in Biology from U. Akron in 2005. Congratulations to Jacki for her successful thesis defense in spring 2006! Jacki's thesis was published in Animal Behaviour summer 2008 and the article was highlighted by New Scientist. Blackledge, T.A. & J.M. Zevenbergen. * 2007. Condition dependent web architecture in the western black widow spider. Animal Behaviour. 73: 855-864. Blackledge, T.A. & J.M. Zevenbergen* 2006. Mesh width influences prey retention in spider orb webs. Ethology. 112: 1194-1201. Burhan worked in the lab through the McNair Scholars program at U Akron. He investigated how the cobwebs spun by the common house spider change as spiders mature. Burhan's project included characterizing the shapes of cobwebs and examining how the structural and material properties of spider silk change as spiders age. He found that both the mass of silk in webs and the sizes of individual silk threads scale strongly with increases in body mass as spiders age. The numbers of sticky gumfooted threads in webs, which are used to trap prey, varied inversely with spider condition. This suggested that well-fed spiders may reduce investment in the prey capture elements within cobwebs even as they maintain an overall high level of investment in silk. Chad investigated how the spacing between rows of the sticky silk (mesh width) in orb webs affects the biomass of prey captured by spiders. By removing every other row of sticky silk from webs, using a hot wire, we were able to compare the prey capture of two spiders of the same species - one with an intact web and the other with half as much sticky silk. Preliminary analysis suggests that an increase in the mesh width of orb webs does not affect the probability of capturing prey. However, spiders with closely spaced spirals of silk in their webs were more likely to capture exceptionally large prey. This suggests that the capture of rare, large prey has played an important role in shaping the evolution of orb web architecture. The results of this project are published in Biology Letters. Chad is now a PhD student in the Integrated Bioscience program. Blackledge, T.A. & C.M. Eliason. * 2007. Functionally independent components of prey capture are architecturally constrained in spider orb webs. Biology Letters. 3:456-458. Hannah is an intern at the Cleveland Metroparks Zoo and is working on her Honors Thesis there. Hannah is testing the utility of operant conditioning through positive reinforcement to modify the behavior of an american alligator to facilitate its care in captivity and to provide behavioral enrichment to the animal. Hannah received second place for her research at the 2007 Biology Undergraduate Research Conference and and is moving to a research internship at the National Zoological Park in Washington, D.C.! Tradeoffs between prey capture and predator defense commonly cause changes in behavior. For instance, starved orb-weaving spiders sometimes construct larger webs, using thinner silk threads, than fed spiders. Within the Theridiidae, the orb web has been transformed into seemingly chaotic cobwebs, which depend upon tangled sheets and gumfooted threads to capture prey. We hypothesized that cobweb spiders with more food resources would invest more silk in webs than starved spiders and that the allocation of silk to gumfooted threads versus the sheet would change with resource availability. To test these hypotheses, we initially fed one group of black widow spiders for eight days while starving a second group. We then quantified web architectures and switched the feeding regimes between groups for a further eight days before repeating the quantification. We found that black widow spiders with more food resources were heavier than starved spiders and that heavier spiders invested more silk in webs than lighter spiders. We also found that starved spiders invested more silk in prey capture elements, sheets and gumfooted threads, while fed spiders directed resources into the three-dimensional tangle. We suggest that fed spiders are allocating silk resources toward the spinning of a defensive three-dimensional tangle, while starved spiders allocate effort toward foraging. This research is published in Animal Behaviour. Sara and Cherec are investigating how spiders utilize silk safety lines during falls. Orb spiders possess muscled valves in the spinning ducts of their major ampullate glands that they can use as a "brake" to clamp down on threads during falls. This musculature is reduced or absent in other evolutionary lineages of spiders so Sara and Cherec are using high speed videos to analyze how diverse behave during falls. Johnny is investigating the effects of water on the properties of spider silk. This work has implications for understanding how spiders form solid silk fibers from liquid protein "dope" and for the application of silk as a biomimetic muscle. Sean is studying energy absorption in spider webs during prey impact. His work involves a combination of high speed video and mechanical testing of individual silk threads. This work seeks to understand how individual silk threads work together to stop the tremendous energy of flying insect prey. Almost all spiders produce silk attachment disks to secure threads to the substrate or to one another. For her honors thesis, Brittany is studying the morphology of these attachments to elucidate common patterns in their production across evolutionarily diverse spiders. Loué is investigating the biomechanics of caterpillar silk. Most research is confined to domesticated silk worms even though many diverse species use silk not just to produce cocoons but also to build shelters, to fold leaf tents, to provide nighttime resting "threads" and to provide signals for trail following by kin. Almost nothing is known about how the properties of caterpillar silks may have changed during the evolution of these different behaviors. Sarah is an engineering student from CalTech who visited the laboratory for the summer. She worked to develop techniques to use high speed to analyze the behavior of individual glue droplets as they stick to surfaces. Our summer 2008 undergraduate research assistants were Kim Lorentz (Biology), Taylor Gondek (Biology), Chad Rooks (Psychology), and Rachel Stevenson (a post-bac. student, now at Denison University). Our 2009 undergraduate research assistants: Kim Lorentz and Sean Kelly are investigating the biomechanics of energy absorption by orb webs during prey impact. Taylor Gondek and Johnny Grebenc are studying how silk interacts with water and the potential application of spider silk as a biomimetic muscle. Kelly worked on the mechanical testing of silk, collaborating with Mohammad Marhabaie (MS student) on his thesis research.